While a growing number of tourists want to discover why "it's more fun in the Philippines", the questionable reputation of its capital Manila puts many of them off the idea of flying in. And who can blame them? The city's "world's worst airport", safety issues, and the horrible public transport system would scare anyone away. But if you're arranging a Philippine itinerary that avoids Luzon Island and focuses on the rest of the country, then by all means, follow the tips below to steer clear of the worst of Manila while still getting to the best of the Philippines. Using Cebu as an entry point, you can easily arrange a Philippines itinerary that completely skips Manila. Cebu is the Philippines' other major international hub: The Mactan Cebu International Airport (IATA: CEB, ICAO: RPVM) connects the Philippines' islands with Hong Kong; Singapore; Seoul and Busan in South Korea; Osaka, Nagoya and Narita/Tokyo in Japan; Taipei and Xiamen. Located in the Philippines' Visayas island group at the country's geographic center, Cebu puts travelers within reach of the nation's top beach destinations. Boracay (via either Caticlan Airport or Kalibo Airport) is one short flight away, as is Puerto Princesa, gateway to both the Underground River; and El Nido, Palawan. The scenic island of Bohol is right next to Cebu, and getting to the former takes only a two-hour ferry ride from the latter. Thanks to Boracay's growing popularity among tourists in the region, more regional airlines now fly directly to Kalibo International Airport (IATA: KLO, ICAO: RPVK), located a two-hour trip from the hotly-contended beach destination. Budget airlines make up a good percentage of the flights connecting Kalibo to Hong Kong; Kuala Lumpur in Malaysia; Singapore; Busan and Seoul in Korea; and Taipei in Taiwan. Choose this option if Boracay is your first stop in the Philippines​ and if you prefer using the bus or boat to head to the rest of the country. Kalibo International Airport is rather poorly connected by air to the rest of the country, with domestic flights to Cebu and Manila and not much else. For an interesting overland adventure, try taking the eight-hour bus ride from Kalibo to Cebu, spanning three islands (Panay Island, Negros Island and Cebu Island) and two ferry crossings. To travel to the Philippines' Rice Terraces or hope over toPampanga's food scene, Manila and its international airport used to be your only option. Not anymore, with the increasing popularity of Clark International Airport (IATA: CRK, ICAO: RPLC). Another former US Air Force base repurposed for civilian use, Clark Airport now services low-cost airlines flying in from regional hubs like Hong Kong, Kuala Lumpur, Doha, and Singapore. If Cebu and Kalibo are unavailable as travel options, you can skip Manila's traffic and other assorted horrors simply by staying a jeepney ride away from Manila's Ninoy Aquino International Airport (NAIA). NAIA is a mess - four separate, unconnected terminals arranged around an aerodrome in Manila's Pasay City. Each terminal flies different airlines to different cities; Terminal 2 (Mabuhay Terminal) is exclusive to Philippine Airlines, Terminal 4 is a small domestic terminal, and Terminals 1 and 3 service major international flights. This awkward arrangement means transitioning between layovers can be a complicated affair. 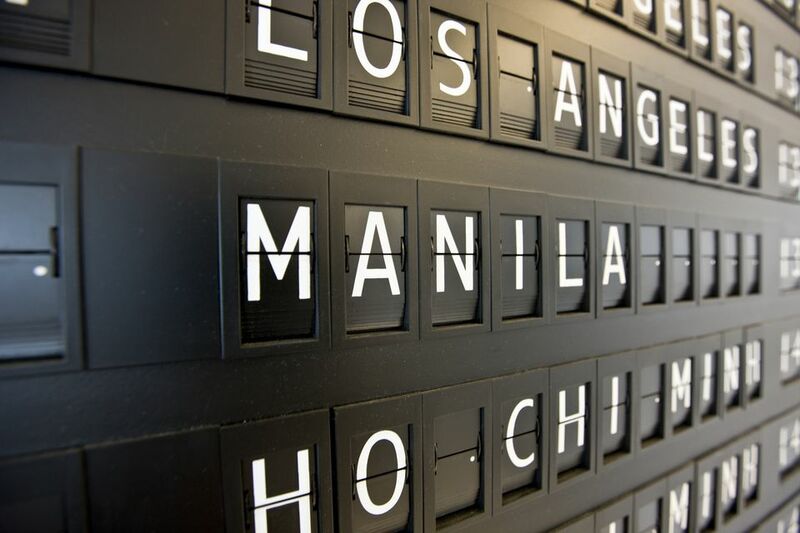 Consider staying in a hotel near your departing terminal, if a layover in Manila cannot be avoided. Travelers leaving from Terminal 3 have the best mid- to high-end options, as the Wings Lounge and airport hotel can be found right on the premises, while Resorts World right across the road offers the Marriott Manila, Remington Hotel, and Maxims Hotel in one go.